The Horror Writers Association has announced the list of nominees for the 2013 Bram Stoker Awards. 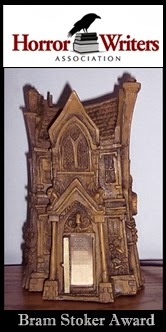 The winners will be announced on May 10th at the 27th annual Bram Stoker Awards® Banquet held during the World Horror Convention 2014 in Portland, Oregon. If nothing else, I've been made aware of some more books to check out. It's always a little depressing that each time a nominees list comes out for some award, I've at most read a book or two. Go figure. Gef, I know exactly how you feel. There are a couple of awards that keep adding titles to my already huge to-be-read pile of books.